An otherwise healthy 42 year old female presents to the Emergency Department complaining of 4 hours of constant epigastric pain and vomiting that began 30 minutes after eating lunch. The pain is sharp, constant, radiates to her shoulder blade, and is 8/10 in severity. She has been unable to hold any food or liquid since the vomiting began. She has vomited 3 times She denies hematemesis. She is concerned this is food poisoning. She states she has never had this happen before. However, she has had some episodes of mild abdominal sharp pain after eating that resolved after roughly an hour. After she gives you the history, she vomits yellow liquid in a basin before your eyes. EKG demonstrates a tachycardic sinus rhythm. Chest X-Ray is negative for any acute process. WBC is mildly elevated at 13.4. The rest of the CBC, electrolytes, U/A, AST/ALT, alk phos, lipase, bilirubin are within normal limits. You obtain an ultrasound which demonstrates the following. 1. What is the most sensitive test for cholecystitis? 2. 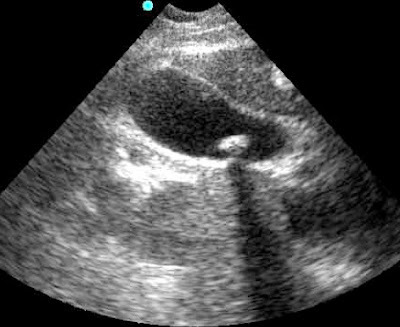 Which infectious agent causes the majority of cholecystitis in the United States? 3. Porcelain Gallbladder is associated with which of the following?